For this month's "Maps Of The Month" featurette, I wish to draw your attention to Vorpal86's The Legend Of The Mystical Ninja (Super NES) maps. In this Konami action game, Kid Ying (Goemon) and Dr. Yang (Ebisumaru) first investigate a ghost woman at the local temple, but soon find themselves fighting against the Otafu army while attempting to save a princess. The Goemon series is very wacky, and very Japanese. So much so, that only a handful of Goemon games (out of dozens) were released outside of Japan - the first was The Legend Of The Mystical Ninja, for the Super NES, in 1992. But in this game, Goemon (based on Japanese folk hero Ishikawa Goemon) is instead named "Kid Ying", and his friend and partner Ebisumaru is known here as "Dr. Yang". Localization has its quirks, but what isn't lost in translation is the fun and zaniness of these bizarre adventures in a cartoon-like version of Feudal Japan. Ninja, samurai, kabuki, sumo, tengu, tanooki, saunas, cherry blossoms... if it's at all associated with Japan, it's probably in here somewhere. These solidly-made maps by Vorpal86 show us this colourful and cutesy, yet diverse world. We've got the Otafu base, with rooms that rotate! We've got a bridge guarded by a giant (but somehow adorable) octopus (tip: you can walk by it without fighting it)! We've got villages thoroughly mapped (including price lists of shops)! Do you need passwords? Vorpal86 has provided those too. 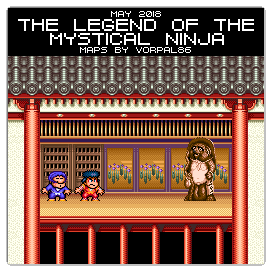 So the recognize the effort put into mapping this mystical legend, Vorpal86's The Legend Of The Mystical Ninja (Super NES) maps will be known as VGMaps.com's Maps Of The Month for May 2018.